Sunday registration: a cocktail, buffet and free backgammongift is included. Quarter entry: 4 players to play knock out: 1 winner gets his/hers entry ticket, included registration. Report Dutch Open 2006 ! Pokertournament (1st) a great success ! This time the tournament was organised in café Spiegel. The hosts really had done everything in their power to make it a smooth tournament and could even provide on the last day very suitable tables to play backgammon. Friday evening around 8 o'clock the warm-up started. The 1st price, the well-known Snowie pro disc edition 4 generously sponsored by the Snowiegroup did go to the winner of the final played between regular visitor Guido Hehmann from Hannover and Nol Heyerman. The last mentioned won. This former striker of footbalclub Sparta Rotterdam plays backgammon since God knows when, has never read a backgammonbook and despite of all technical developments survives well. His nickname is "the Wall''. Besides the warm-up, players could also show their skills in quarter entrees and/or minjackpots. 5 British players Myke Wignall, Paul Gilbertson, Paul Barwick (winner Beach 2005), Andy Bell (producer dvd’s Rivieracup and Monte Carlo) and Mike Heard, would arrive Friday afternoon, but around 22 hours they still didn't arrive. To check it out I went 2 times to their hotel without any result. The 3rd time I woke up and went straight on to the bar of hotel Atlanta and of course the gentlemen were there to celibrate their save arrival or what ever. After taking them to the Spiegel, Fridaynight wasn’t the same anymore and it was the beginning of a restless night in Rotterdam. Saturday afternoon 24 players,5 British 1 German and 2 Belgian players, completed with Dutch players, among them the latest worldchampion Philip Vischjager started the Main. 8 unfortunate losers could and did re-buy After the 3rd round 4 players remained to play half finals on Sunday. The consolation was played untill the last 8. Only 4 die hards for the intermediate, because some, on second thought, switched to to the Main. These 4 played Round Robin and Susan won the trophee. Now it was time to introduce Texas Hold’em. Under the guidance of Jeroen Romme and Paul Bayens 18 players started on 2 professional pokertables.The 1st hour unlimited re buys and the blind went up every 20 minutes. The last hour I was still in playing 4 others The public went crazy. At that moment I was the chipleader and had serious chances to get to the last 3 to pick up a price. My inexperience (1st time I played) and the fact that I got an ace every hand that wasn’t sufficient made my chips melt like snow. Exit, but an worthful experience richer ! The remaining 4 did go on and the most experienced/professional man became winner: Andy Bell. Sunday afternoon: After a solid brunch the fights went on. Hassan defeated Rogier van Gemert and Mike Heard concerred Arthur Braacx. The final was a bit one sided, where Mike wasn’t in trouble in any moment. At the Conso the fight between Myke Wignall and Hans Willem for 9 points also started. Myke promised me that he would finish the job within 15 minutes. He was right, however lost the game. After been redoubled he lost a gammon and the Crawfordgame was finished off by Hans Willem in a blink of an eye. Because the winner had to catch his flight and all games were ended the prize giving was started up. After that I dropped Mike after a 5 minutes drive to the Central Station where he went to Schiphol by train. Later on he mailed me that the gate was already closed, but a nice Schipholemployee let him go on the plain. How much luck one can have in just one weekend !! The trophees were handed over to the winners by Brigitte ( thanks again for your assistance) After the distribution it was time for the buffet. Cook Anna made a fantastic variety of food such as, soup, rice, saté, chickenwings and all kinds of meat, fish and fruit. Bottles of champage were opened and gave this festival the finishing touch. Around 9 o’clock players were ready to chouette or play the last freeze out ( only 1 by in ) pokertournament. This time 9 players. Alex won and Pierre was runner up. These 3 days were great fun for everbody and according to what I've heard everyone has had - more or less successfully - a nice relaxed weekend. What a fun weekend this turned out to be! I had to use all of my persuasive powers on Slatts to make him come to this new tournament as he was already planning to go to the opening weekend of the MSO at Manchester. Ed Baars had done a good job of promoting the tournament at Monte Carlo and Myke Wignall, my brothers Paul and John and Ernie Pick were all saying they were going. I didn’t want to miss out on this one! As it turned out there were 9 Brits playing in the tournament and we took home 8 prizes between us! Read on and see how we all got on – Tony Fawcett was the star performer and deserves a special mention, as this was his first international tournament! Slatts, John. Paul and I arrived on Friday afternoon to find Ernie at the hotel waiting for us and dying for a game! The Friday evening play was in the Maritime Café just around the corner from the Tulip Inn where we were staying. The action was centred on the quarter entries and the Warm Up tournament. Ernie met Slatts in his quarter entry final having beaten the winner of the August Gammonitis tournament, Rene van der Plujm. He played a good game but Slatts was triumphant. In the warm-up Ernie and Slatts were looking forward to playing each other again in the final, as they had both reached the semis in separate halves of the draw! Unfortunately, it was not to be as they both lost! However, they did each win a Special Backgammon Edition of Jameson’s Irish Whiskey. I am sure they both considered this to be better than the first prize of Snowie 4, which, as those of you that know the 2 players concerned, would have been of no interest at all!!! The whiskey actually ended up costing me 20 Euros! On Saturday, we woke up to a very grey, murky, wet day and felt like we were in England! The idea of a beach tourney had sounded a great idea at the time. I decided not to put my bikini on (much to the relief of all present!) and went across to the playing area, umbrella in hand. Myke Wignall, Tony Fawcett and his wife (a non-player) had arrived to join the British contingent and we met up with Zoë Cunningham and her friend Sean (Fox Reformed players) at the beach. Ed Baars and Michel Buket had organised the tournament in a very friendly beach bar. Slatts, Paul and Ernie joined the 32 players in the Masters and the rest of us decided to play in the 16 draw Intermediate tournament. Surprisingly, none of us were drawn against each other in the first round. There were also 8 beginners playing. After the first days play had ended the Brits were feeling good. Slatts had qualified for the Masters Main semi-final and Paul was in the Masters Consolation quarterfinal. However, this was a bit of a disappointment as he had thought his win in his last match put him in the semi, but it was a progressive consolation, resulting in him effectively playing 2 quarterfinal rounds!! Myke, Tony and myself were all in the Intermediate Main semi-finals, which meant at least one of us, was going to go through to the final. The atmosphere in the playing area was very good although it was quite noisy. In the evening the bar was full of non-bg players enjoying an evening out. There was a Doubles Consulting tournament and Jackpots going on throughout the evening. Ed Baars told us that the sun was going to shine on Sunday and I am pleased to report that it did! It made a nice change to be out in the open air playing. I decided that I should play 24 – 16. Not Snowie’s favourite but definitely the play of most of the players whose opinion I asked for after the match had finished. Tony said “I’m going to roll 4 / 3 so I had better cube you!” He actually thought that if he didn’t hit he would get gammoned and lose 2 points and the match anyway. I took the cube and sure enough the dice gods turned and gave him the 4 / 3! I did manage to save a gammon but that game proved to be the turning point in the Match. Tony played very aggressively and I couldn’t do a thing! He didn’t let me win another point and won the match 13 – 15. Needless to say I wasn’t very happy and told Slatts he had to give me a few lessons on how to win from 2-away. I always seem to struggle to win when at that score! Still, as he pointed out, I had still won a trophy and some money so should be pleased with myself. Myke in the meantime had come second to Leon Weyl so Tony faced a Dutchman in the final. I kept an eye on the match and felt sorry for Tony when he once again found himself trailing 15 –6 to 17, losing 7 games in a row. His opponent asked for a break at this point and I just reminded Tony about his 4/3 joker at 13 – 6 down against me and told him to come out fighting. This is just what he did! Leon made the mistake of cubing when 2 away. Tony took and gave the cube back on 4. 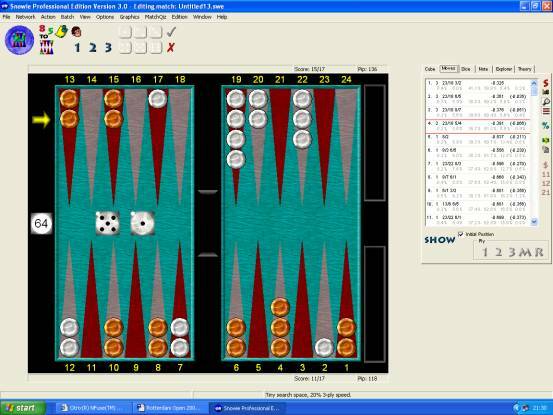 He rolled well and won the game putting him back in contention at 15 – 10. Tony cubed early on each of the next 3 games, all of which he won! Score now 15 – 16 to Tony. By now the Brits watching were spurring him onto victory and he didn’t let us down. A big congrats to Tony winning his first International Intermediate tournament at the first attempt. In the Masters, Slatts sat down to play his semi-final against Rogier van Gemert, currently considered to be the best Dutch player. They were quite evenly matched. Slatts considered his move for some considerable time and opted for 23/18 6/5. He had decided that his play gave him more flexibility and Rogier still had 4 points to clear with no spares. Slatts strengthened his board and Rogier left him a shot. At this point Slatts cubed to 2. Rogier admitted that he didn’t like seeing the cube, but after giving the position due consideration he took it. Slatts missed the shot and Rogier went on to win the match. Francois Tardieu was watching the game and told Slatts that he agreed with his cube decision. Rogier went on to meet an up and coming young Dane in the final, Sander Lillof. Rogier was considered to be the favourite and had a lot of local support of course. 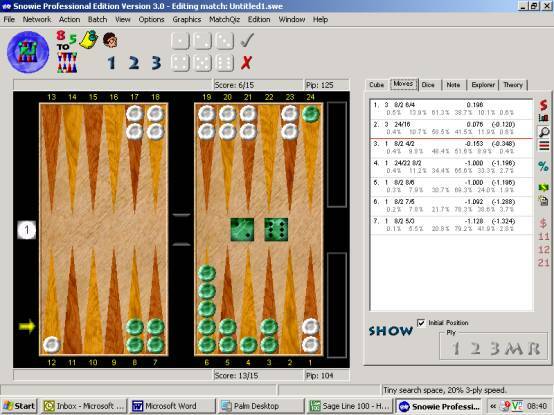 He went 7 – 4 down but then won 8 points in one game to take the lead 7 – 12 to 19. Then Sander fought back and went ahead 15 – 12. They got to this position and Sander was looking at whether or not to cube for match. No Redouble / Take position. This a redouble for money but not at this match score. Sanders inexperience showed here. Rogier took the 4 cube and redoubled to 8. He got the better dice and won the game and the match. Meanwhile, Paul was playing his consolation final. He didn’t appear to be having much luck (no change there then!) and found himself in this position at 7 – 4 down to 15. Paul felt that if he could hit he had a good chance of picking up 4 points. He was, of course, well aware that if the dice gods decided it wasn’t his day that he would be massive underdog in the match. Paul rolls 4/2 He moved 9 – 5* / 8 – 6 Snowie favoured 9 –5* / 5 –3 but only by a very small margin. Tore rolls the joker 6/5! Hits and closes his board and gammons Paul for match. Myke decided to get some more playing action and went into a 50 Euro Jackpot. He played in his usual flamboyant fashion and when Tony, Paul and I were watching he had got himself into this position in the Crawford game! Yes, he did manage to win the game. Not only that he went onto win the match!!! Unfortunately for him he didn’t win his next round so didn’t cash. Included in the registration fee was a free meal on Sunday night. This could be eaten at any time between 4 p.m. and 8 p.m across the beach. It was chicken sate, chips and salad and was very tasty. Michel and Ed ended up giving out the prizes at about 9 p.m. and there was free champagne for everyone. Brigitte from Antwerp gave out the prizes and a special thanks goes to her for assisting Ed in running the tournament. The general consensus was that it was an excellent tournament and well worth a visit next year. The 1st round draw on Saturday had me paired against Peter Gelpke. After a bad start (10-5 till 15 behind) the luck was turning and gave me 3 single points and one doubled gammon. 2 games later I won the Crawford game for the match. I had 2 very interesting positions to play and my plays here didn't really turn out as the top choice so to speak. 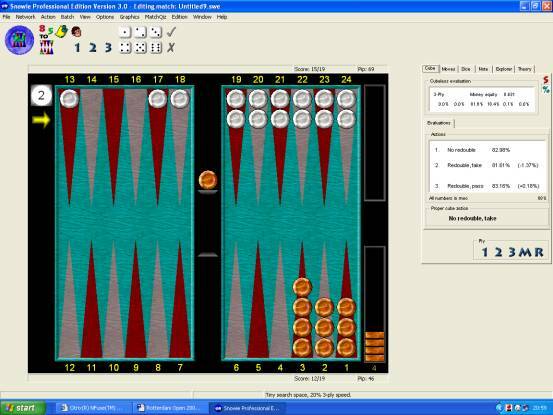 Luckily backgammon is all about rolling fantastic dice in those moments one has to think. The 2nd round was a match against Erik Sorensen from Denmark and just like in the 3rd round against Guido Hehmann from Germany I was very lucky indeed. I easily went through these rounds with 15-10 and 15-7 respectively. I now survived the 1st day and I was allowed to take on John Slattery from Scotland in the semi-final. Sunday: the weather is great today so playing outside seems almost obligatory. The 17 point semi final against the 2003 European champion went up to 8-9 to Slatts were the luck still was evenly divided. With some amazingly perfect joker rolling from both sides. But now somehow my dice (at least the ones I borrowed from Slatts, it was his board) got into an even higher gear. I won a doubled gammon, a doubled race ending in 6/6 and 4/4! And a game Slatts just had got to give away even on this score gave me an overwhelming 15-9 lead. The next game gave me a relatively easy take for the match. I had some race and I only needed an eight for an immediate win. This didn't work out this time and Slatts brought this game home in marvellous fashion (15-11). The next game had Slatts playing a bar point holding game with another loose checker in my weak home board. I still had 4 points to clear . So it was a pretty even game. Slatts got an extremely difficult 5/1 to play and thought about this one for about 15 minutes. I was very happy that it wasn't my position. In the mean time I got some drinks for the pair of us, it was my turn anyway. Yes, yes it was a very cozy semi final. Anyway Slatts decided to step up, which turned out to be top choice. 1 roll later I decided to clear the farthest point leaving a voluntary deuce shot. This was a small mistake according to the computer. Anyway Slatts doubled on this shot. And I again had to eat this cube for the match. Slatts missed! I cleared up the rest without leaving any shots. Winning the race turned out to be very easy. The final turned out to be a real thriller against Sander Lyloff from Denmark. My again very sporting opponent and me pushed each other to the limits of this mind battle with sizzling joker and anti-joker rolling to make it also fun for the spectators. I had the somewhat better dice on decisive moments. Example: 4-7 till 19 behind gave me a redouble to 8 in a 65% race, which I easy rolled home. 12-7 ahead and over the moon. Every game until 12-15 was for my opponent when we reached the unexpected climax. I had doubled pretty soon on some vague gammon threats, and jokers alternated each other in ridiculous fashion. I seemed to get the last one when I closed my homeboard with a man on the rail and about 60% gammon-win guarantee. I bore off 4 men and obviously had to leave a shot. Got hit and closed out, hmm. I now am about 18% in this game. And Sander decided to redouble to 4. The bot would have waited but also stated that doubling wasn't a mistake in the rollout. There is always the chance the opponent passes in disgust. After all the position is a moneygame pass. After a lot of teeth grinding I took and redoubled to 8 (again!) for the match . From then on the last game tended to get my way again. Sander immediately had to clear his 5 point , where I immediately entered with 6/5! I roll 5/1 (2 off)!!!! left me with 2 men on the deuce point! Any next single ace would lose if I ever get the chance to roll for it anyway. Sander shook for the last time. Rolls...................... 3/2!!!!! It is in my hands now. I shook shortly as I wanted to get it over with and rolled fast. One die was spinning for about 3 seconds (this felt like eternity). The die already flat in the board showed an ACE! OH NO 5 aces in a row!!! The last die finally stopped spinning and showed another ACE!!!!!!!!!! What a rush!!!!! bad luck that is not sportsmanlike to me. But certainly now you will not hear me complaining for the coming year anyway. Sander congratulated me with this fantastic victory, which kept the Beach Trophy in the Netherlands, and we had a few beers afterwards. I can only hope if I ever reach a final again and are supposed to lose the way he did that I will react as sportily as this Danish opponent did. On 4, 5 and 6 june the Rotterdam Open was played in the Tulip Inn Hotel. Fridaynight the quarter entrees and the warm up with 16 players. Almost all contenders played the quarter entrees. Bert played against Geert, Bert won in only 1 game because of a 8-cube. In a close game against Shin from Tokyo he got his entree into the main tournament. Rogier ( Runner Up Intermediate Monaco 2003 ) played Rolf Schreuder, who was a long time one of the best players in Holland and was in the "Backgammon Giants top 30", but the dice of Rogier rolled on command and so he won 13-0 !! a "no redouble/take" was doubled by Paul and was passed by Rogier. Undoubted a lot went wrong in this match but the tension was enorm. Rogier won. In the big final Paul Bayens didn't have his luck and Hans won relatively easy. The last chance was won by Paulus to beat Rene , Ed and Mac. THE INTERMEDIATE/BEGINNERS- tournament was played wih 6 players. Ed decided to let each player play to the other 5 contenders ( 9 points ). It was a very cosy and good weekend and everybodey had a fine time. I hope you noticed that the players who come to Rotterdam are playing very well. We hope to see them and a lot af more players next time. Thanks to Brigitte Lieferinck for the notations and Paul for the boards.